Rich, gooey, chocolatey, coconut flavored s’mores macaroon bars make the perfect after school snack or dessert! I love coconut and lately I have been craving it like crazy! When my Foodie Pen Pals box came last month and it had macaroons inside I thought to myself, I wonder how these would taste as s’mores? A few days later I still couldn’t get the flavor combination out of my head – I have a serious addiction to marshmallows; sometimes I eat them plain, straight out of the bag. Anyway, on to the s’mores, I already knew the macaroon s’mores I had experimented with a few days before were divine, so I set out to make my own version to share. These gooey, chocolatey, coconut flavored s’mores macaroon bars will leave you wanting more than one and a glass of milk to wash them down with. I shared them with our play group friends and they were a huge hit with the moms and kids. So get on up and head into the kitchen (or to the store for supplies) and make these now – enjoy and happy baking! Preheat your oven to 325º and line an 8"x8" baking pan with foil and prepare with cooking spray. In a mixing bowl combine the coconut, sugar, flour and salt. Stir in the egg white, coconut oil and vanilla until blended completely. Press the mixture into the bottom of the baking pan evenly and bake for 23-25 minutes, until golden brown on top. Turn off your oven and remove the baking pan; evenly distribute the chocolate bars over the crust, top with marshmallows and sprinkle with the mini chocolate chips. Return the pan to the oven so the chocolate will melt, for about 10 minutes. Broil the bars at 300º for 3 minutes, watching carefully not to burn the topping. Remove carefully and let cool completely. Slice and serve. They were quite divine! I hope you’ll try them. Yum! These look so good!!! These look amazing. We have a link party called Wednesdays Adorned From Above Blog Hop and would love to have you share this and any other posts with everyone. It runs from Tuesday night through midnight Sunday. Here is the link to the party. Ummm, woah. Those look so incredibly good, and I’m not even a coconut fan. Now that’s a good recipe! G’day! WHO could resist the combination of chocolate and marshmallows? 🙂 YUM! Those look like the ultimate. I loved the flavor combo too! Wow, this looks fantastic! It reminds of a dessert called campfire pie at Cindy’s Backstreet Kitchen in St. Helena, CA. Thanks for visiting my blog last week and making my SITS Day special! I hope to see you again! 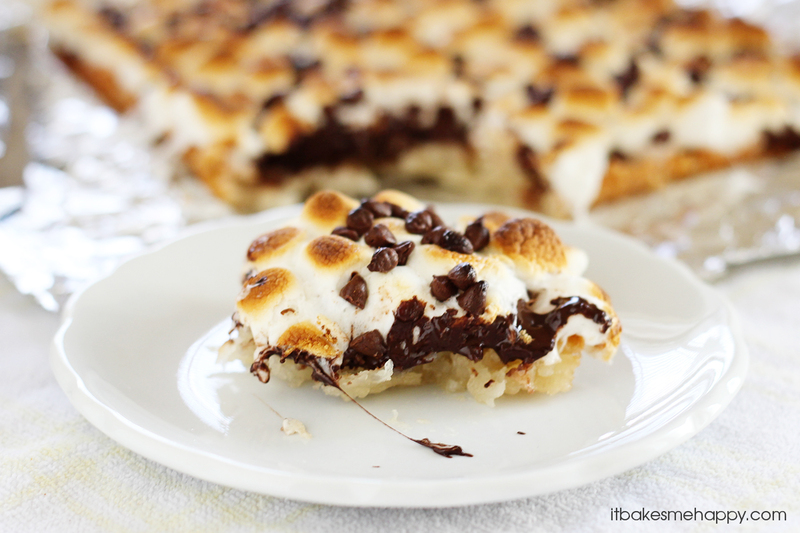 S’mores are a fav at my house – I’m going to have to try this! Found you at Crumbs and Chaos! I am so excited to try this recipe! My two favorite desserts are smores and coconut macaroons so I can hardly contain my excitement at combining the two. Thank you so much for sharing!